Loneliness has its own needs! Sometimes, the loneliness probably got to be too much and anyone seemed better than no one. Locked into loneliness were we two and looking at one another every evening we each saw the one we blamed for it. Utter loneliness was planted in me then, and sent its deep roots down into me. It’s about isolation and loneliness, but it’s also about friendship. Being exactly what the other person needs. Loneliness is like being the only person left alive in the universe, except that everyone else is still here. It takes loneliness in oneself to recognize it in another. To the extent that one is responsible for one’s life, one is alone. Love was the result of having caught a glimpse of another’s loneliness. 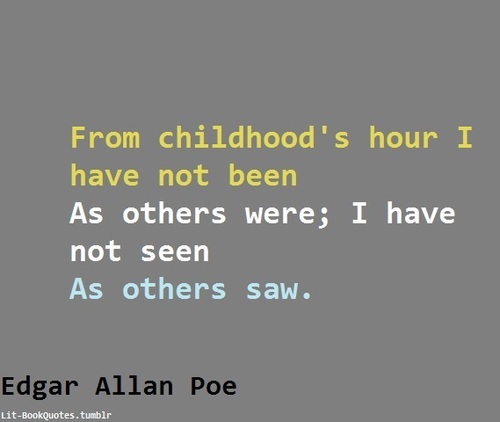 From childhood’s hour I have not been. As others were; I have not seen. As others saw. Loneliness is, I think, people’s biggest fear, whether they are conscious of it or not. Most men are not aware of the very significant distinction as to whether their loneliness is caused by the world’s having left them behind or their having left the world behind.